When Music Calls Album reviews. Branford Marsalis used to have a great gig on the Tonight Show, but he went off to do some fusion-funk music which helps you to feel the uncomfortableness of your chair at the concert. Joshua Redman's group is amazing in concert, but by the end it's a bunch of sparkling techniques that you no longer care about because he did the same lick three songs ago. Please don't mistake me, I am a huge fan of both Marsalis and Redman, but their albums don't lend themselves to good listening. Anton Schwartz: pop the CD in the player and your foot starts tapping. He's got a sound that feels good, soothes the ear, and grooves your jazzy soul. Anton Schwartz has a great jazz combo sound! Picture your typical hotel lounge combo. Now pretend that they are actually good, really good, and you've got Anton Schwartz. It's a great find to come across this fresh sound. Jazz listeners haven't seen too many straightforward groups over the recent years while the up and coming have followed the supposed need to do something new and different. Now we've got a saxophonist who plays what we want to hear and has a tight rhythm section behind him. The album When Music Calls is nicely composed. I found an adequate variety of style to keep it interesting, but within a narrow enough range to make it bearable. A few down tempo songs are mixed in with some really groovin' tunes. A few songs in minor keys balance out the happy tunes. The classic solo breaks open up the welcome sounds of a melodic saxophone, slappin' bass, and great drumming. When Music Calls has everything on my list, everything I want to hear. 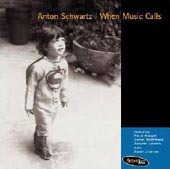 I applaude the work Anton Schwartz has put into this album. He's building a promising future for himself. His success will lie in writing music for the jazz listener rather than for the masses of pretend-to-know-it-all jazz critics. You can get more information directly from the group by visiting their website AntonJazz. The calling has been around for a while, I am glad Anton followed it.